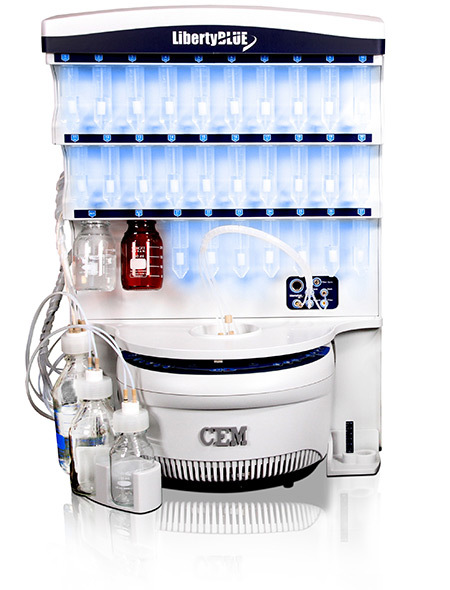 CEM Corporation is transforming the way chemists perform peptide synthesis once again with the introduction of the Liberty BlueTM automated microwave peptide synthesizer. More than just a facelift, the Liberty Blue system has been designed for maximized speed and efficiency. With 4-minute cycle times and a 90% solvent reduction, no other peptide synthesizer on the market can even come close to the performance of the Liberty Blue. Couple with that unparalleled peptide quality along with greater flexibility and improved reliability, Liberty Blue is the system of choice for all your peptide synthesis needs.